Half-full dress is just a general term for Half dress, a semi-formal type of outfit worn from the afternoon into the early evening or for informal evening gatherings. Usually the fashion periodicals like to specify what the half dress is for, such as to wear to a dinner party or the opera. 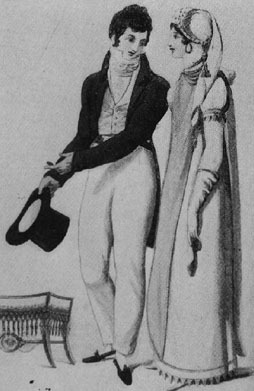 Lady and Gentleman in "half full dress" of 1808, plate fromLe Beau Monde. The Man wears trousers, a more casual form of dress sometimes not allowed by more formal clubs holding evening assemblies. The man also has on a simple waistcoat, high cravat, and cut-away style dress coat. The woman's gown is trimmed with Vandyke trim on the sleeves and hem. The bizarre headdress resembles a stocking cap with its long trailing drapery end. The woman wears much more jewelry than would be appropriate for undress, including hoop earrings.